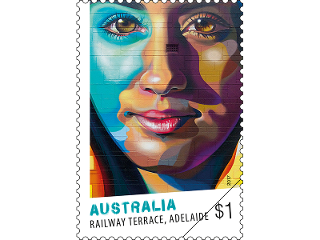 Australia Post has celebrated street art across the nation by releasing 4 stamps depicting the best examples. One image shows artwork on a house in Railway Terrace North in Goodwood. Fantastic recognition of the local street art. I give it a lick of approval. Oh, by the way, 2 of the stamps show images of street art in Adelaide. Not bad for a sleepy backwater town!